Are you in the NYC area? Sign your child or teen up for personal training with Fred and his Serious Strength team. gift of strength and health? With his blockbuster book The Slow Burn™ Fitness Revolution , renowned personal trainer Fredrick Hahn revealed the secret to strengthening muscles, enhancing flexibility, burning fat and improving performance in just 30 minutes a week. 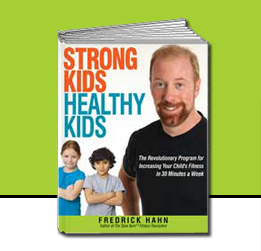 Now, in Strong Kids, Healthy Kids, he shows parents, caregivers, teachers, and doctors how his fitness program can change the lives of children and teens everywhere, no matter what their athletic ability. With this proven program, all children can build their self-esteem, improve their performance, and lead healthier lives. As you all know, childhood obesity and diabetes are at an all time high. I'm aimin' to halt that! My new book is designed to educate parents, caregivers, health professionals as well as kids how to avoid the growing epidemic of adolescent ill-health. Depending on how book sales turn out, my goal is to donate a copy of Strong Kids Healthy Kids to all New York City Public Schools. So, know that your purchase will contribute to making this a possibility! If you are interested if giving your child the benefits that strength training can bestow, please call us at Serious Strength Personal Training Studios (212) 579.9320 or email me at fhahn@seriousstrength.com. We'll be happy to send you a booklet that contains all the information you'll need to have confidence that what we say and do for youngsters is safe and effective. For starters please click here for more information about our Strong Kids Healthy Kids or Fit Together training programs.